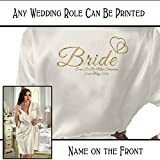 Ivory Dressing Gown / Robe Lightweight Polyester Satin Perfect Item for Your/ Her Special day Bride/Mother of the Bride/Groom Maid of Honour/Bridesmaids OR A Perfect Gift for Mothers Day/Mum’s Birthday or That Special Occasion. We have Several Different Designs Available And Can Personalise To Suit You or Your Occasion. Your Colour / Font Choice. These luxury Soft Satin Polyester Robes have a luxurious feel and a beautifully printed image and, or text on the front & back. The personalisation is included in the price, if you want details omitted, such as, no name on the front, please just include all the details you need in a message after you have ordered. They Can Be Personalised With Your Own Message & Colour Choice for the Text. Fully washable, the printed images / text is permanent and will not fade.